Behold! The Lexus LC500. While this is my first acquisition of 2018, this model was greatly anticipated for quite some time. From the time it was announced, I knew I would get it. I was unexpectedly aided in this by Model Citizen making it the January MOTM. As with all new AUTOart models, the LC500l is a plastic composite. 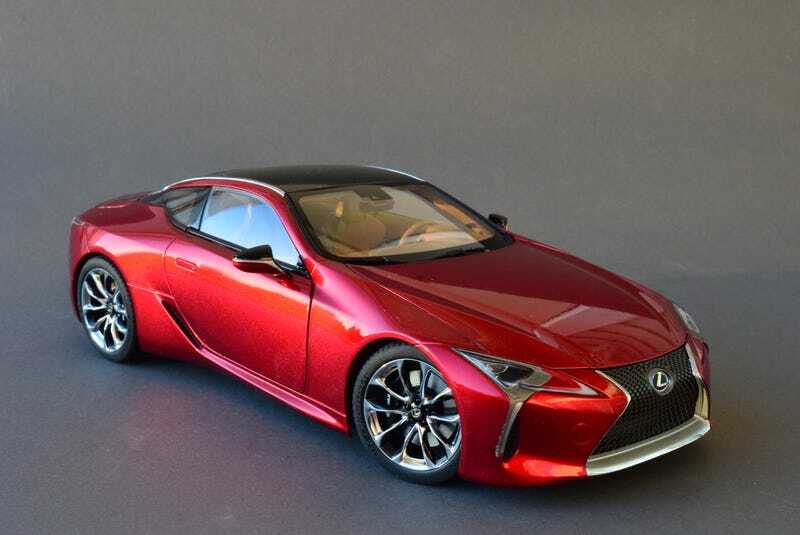 And as with all of the composite models I have from them, the Lexus fails to deliver upon all of the supposed advantages of composites over diecast. It’s not bad by any means, I just don’t see it as being better than their previous diecast offerings. But enough harping on that old subject. Regardless of what is made of, the model looks absolutely phenomenal - at a distance. Get closer, however, and the paint reveals that fine orange peel finish that all my composites have to varying degrees. It also suffers slightly from the pooling at the edges that some metallic paints have. But again, these issues are only obvious when the model is right in your face. It should be noted that other reviewers (both with black LC500s) have not had this problem, so it could be my example or an issue with the metallic red. Now for the good stuff. The most notable feature of the model in my opinion is the grille. It has to be one of the most intricately made pieces of any model in my collection. And according to AUTOart, it is made of metal. Following up that work of art is the headlight/fang/DRL thingy. Though made of a single piece of plastic, it features clear, silver, body color, and frosted finishes. The taillights are equally well done, though they look like they may be a two-piece affair. I may not care for AUTOart’s pricing, but these pieces at least show where some of the money goes. Speaking of which, not only does the trunk lid feature fancy articulated hinges, but so does the poseable spoiler. AUTOart’s effort under the hood is decent, but some decals would have been nice considering the price. Lastly we go to the wheels, which are well done as is usual for AUTOart. But something new is that the tires are branded. Hopefully this is something that will continue. Moving inside, AUTOart has done a good job replicating the minimalist interior of the Lexus and I especially like their effort at texturing the plastic to look like the suede trim of the real car. I do wish that they had replicated the buttons under the HVAC display, and that the seatbelts were fabric, but their lack of inclusion does not detract from the model. Overall this is a very good, if typical, effort from AUTOart, but it’s a tough recommend due to the price point. I just hope the rest of 2018’s acquisitions are just as good.